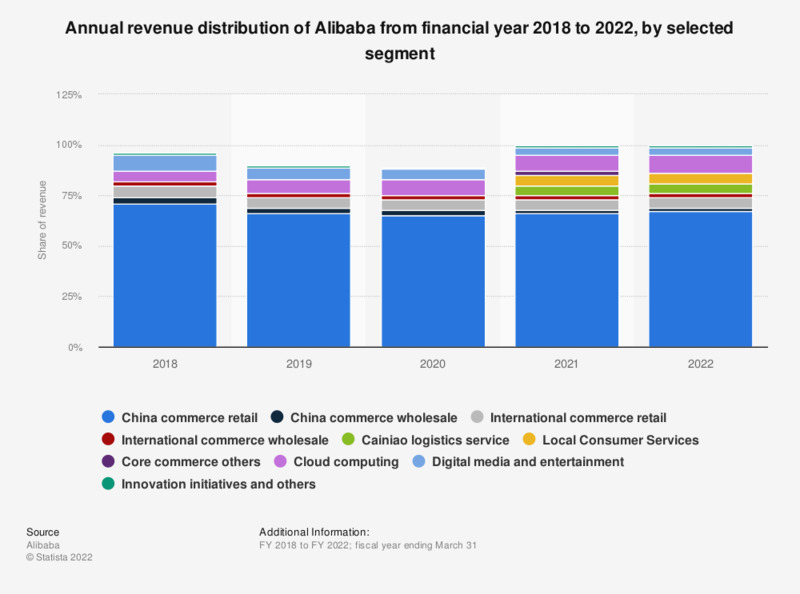 The statistic shows the annual revenue distribution of the Alibaba Group from 2016 to 2018, sorted by segment. In the fiscal year ending March 31, 2018, the Chinese e-commerce corporation generated 6 percent of revenues through international online retail sales. Local e-commerce sales in China amounted to 76 percent of total revenues. (1) Revenue from core commerce is primarily generated from our China retail marketplaces, 1688.com, AliExpress, Alibaba.com and Lazada.com. (2) Revenue from cloud computing is primarily generated from the provision of services, such as data storage, elastic computing, database and large scale computing services, as well as web hosting and domain name registration. (3) Revenue from digital media and entertainment mainly represents advertising and subscription revenue generated from our digital entertainment business provided by Youku Tudou and mobile Internet services revenue from UCWeb businesses. (4) Revenue from innovation initiatives and others mainly represents revenue generated by AutoNavi and YunOS, as well as fees from Ant Financial related to the SME loan business. How high is your online revenue share?